Taking a person or issue and layering it in a different metaphorical context has long been a way we humorously address subjects and issues. 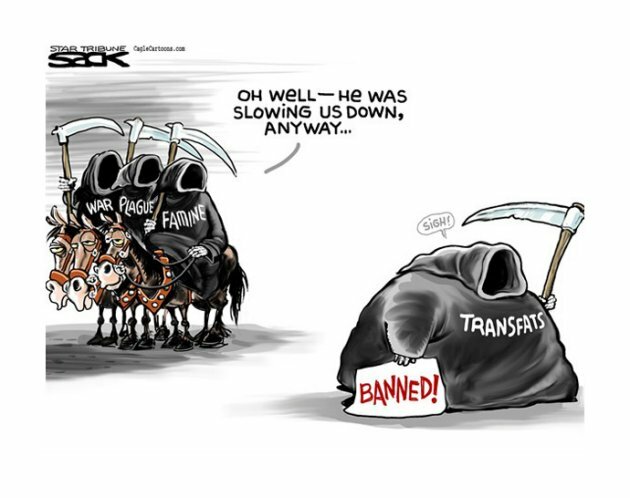 In this editorial cartoon Steve Sack cloaks “trans fats” as one of the Biblical four horsemen of the apocalypse. In today’s chapter, God uses a similar device in delivering a prophetic editorial against the King of Tyre. In today’s chapter, God takes up the editorial pen against the King of Tyre. He’s already delivered strong messages against Tyre as a city state (Ezekiel 26), and an even more narrowly targeted message against the merchant class (Ezekiel 27). Now, God whittles His message down to the King of Tyre in an individual rebuke. God uses irony and imagery, picturing the King of Tyre as Adam in the Garden of Eden before the fall. He figuratively dresses the monarch with the adornments of a high priest. The metaphor is clear. The King of Tyre thinks he’s all that. He believes himself to be human perfection, to be Adam (the first of creation, created sinless in the Garden) and Aaron (the first High Priest, the chosen of God to be the mediator between God and humanity) rolled into one. Apparently, the crown royal of Tyre fashioned himself as a god on Earth as many monarchs did throughout ancient history. God, through Ezekiel, muses on whether the king will feel so divine bowing before those who will kill him. Today, I’m thinking about the myriad of metaphorical ways in which Creator God layers His messages. I’m thinking about the myriad of metaphorical ways in which we as humans, made in the image of the Creator, can layer our message to individuals, to audiences, and to the world around us. I need and want to continue becoming a better and more effective communicator. I like the way you think, Tom. One of the most effective ways to reach the modern mind is through allegory and mythology and metaphor. It allows us to draw close to where people are and nudge and awareness of the Kingdom of God and the Lordship of Jesus Christ.